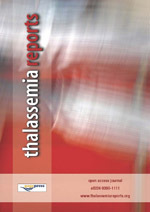 Thalassemia Reports is the premier peer-reviewed international medical journal devoted entirely to the study, diagnosis, and treatment of thalassemia. The journal covers the pathophysiology, diagnosis, classification, and treatment of thalassemia and related disorders for physicians and medical scientists. The primary intent of the journal will be to publish clinically relevant information that will directly improve the care of patients with thalassemia. Basic science studies of interest to those treating disorders will also be considered for publication when relevant. A special section of the journal is dedicated to Case Reports: we would like to invite clinicians and researchers to send us their reports.